Does Peanut Butter Boost Testosterone? Peanut butter is a calorie-dense spread that is sometimes considered to be unhealthy due to its high fat content, but peanut butter can be quite healthy. If you want to increase your testosterone naturally, peanut butter may be helpful, as it contains some nutrients that facilitate testosterone production. However, you should consult a doctor prior to making attempts to modify your hormone levels. One way in which peanut butter may not be helpful for boosting testosterone is that it is low in zinc. Zinc is a nutrient that helps activate enzymes and build proteins, and it may also play a role in hormone levels. A study published in the February 2006 issue of "Neuro Endocrinology Letters" found that zinc helped increase testosterone levels in just four weeks. Thus, replacing peanut butter with zinc-rich foods could boost your testosterone levels more than continuing to eat peanut butter would. One way in which peanut butter may help boost your testosterone levels is that it is high in fat. Each 2 tbsp. 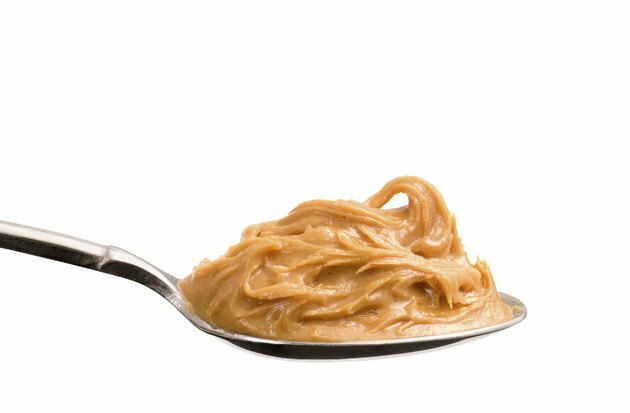 serving of peanut butter contains 16 g of total fat, with just 3 g of saturated fat. In addition to providing energy, dietary fat is involved with proper growth and development. In addition, research published in the November 2004 edition of "International Journal of Sports Medicine" suggests that adequate fat intake is required for healthy testosterone levels. If you substitute peanut butter for some low-fat foods in your diet, you may boost your natural testosterone production. Peanut butter is low in calcium, as each 2 tbsp. serving contains 14 mg. This is about 1 percent of the daily suggested intake of 1,000 mg. Calcium is essential for strong bones as well as proper muscle and nerve function. In addition, a study published in the December 2008 edition of "Biological Trace Element Research" suggests that adequate calcium intake is required for high testosterone levels. Peanut butter is low in sugar, which is beneficial for a number of reasons, as sugar can promote tooth decay and cause wide swings in your blood sugar levels. If you substitute peanut butter for high-sugar foods in your diet, this may help boost your testosterone levels, as consuming sugar can suppress testosterone production. High-sugar foods also tend to be low in fat, so the added fat from peanut butter can also be beneficial for testosterone.